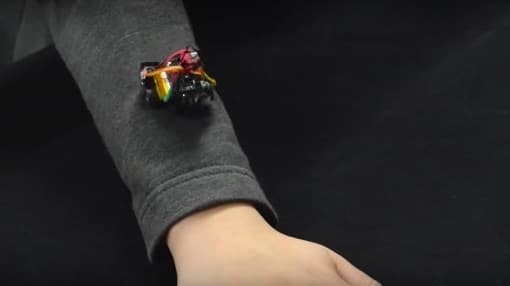 Say hello to the future of wearables, called "Rovables" - the miniature robots capable of crawling on your clothes. Developed by engineers from the MIT and Stanford, the Rovables were recently demonstrated at UIST conference in Tokyo, Japan. As you can see in the following video, these tiny bots can crawl on your regular clothes, both vertically and horizontally. The user will not have to wear any special garment to make the robots work and crawl all over your body. "But why would I need them? ", you might want to ask. The researchers say that these robots can do lot of interesting things. For example, an array of these robots could gather together on the user's arm and create a display that will play a video from YouTube while you're traveling on a metro. A robot could just crawl out of your pocket to notify you of new email or text and then go back into your pocket. If that's not enough, engineers may soon be able to configure these Rovables to form a safety light on your back when you are riding a motorcycle. As of now, engineers are working on building a micro-controller with enough processing power to handle complex algorithms. These robots will have to correctly navigate in 3D space on your body and will need an accurate path-planning. The entire electronic assembly may need to stay charged for hours. The current prototype has enough power to last for about 45 minutes. But since these robots won't be in motion all the time, the battery could last longer. We'd love to know from our fellow engineers what they think about Rovables? Tiny robots crawling on our body may not sound like the best of the ideas; but it might just become a reality in the next few years.